Continuing a season that seems to show him returning to his best form, Yuki Kawauchi (Saitama Pref. Gov't) took over three minutes off his own national record as he won the hilly Okinoshima Ultramarathon's 50 km division in 2:44:07. Run on the island where Kawauchi's late father was born, the Okinoshima Ultra is a Father's Day fixture on Kawauchi's calendar. The course features a relatively flat first 10 km, three 100 m+ tall ups and downs between 10 and 30 km, and an undulating last 20 km capped by one more major hill with 5 km to go. 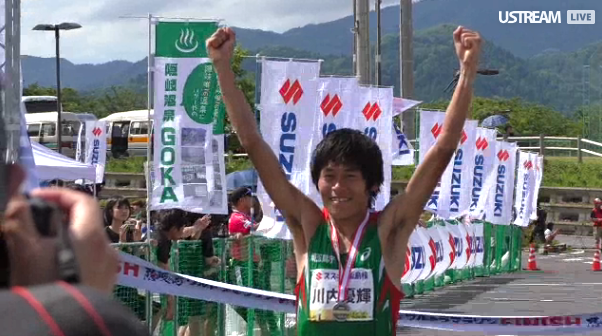 "The weather conditions were better than usual, so I decided to go for the course record," Kawauchi told JRN post-race. Where he has typically opened the first 10 km in 33-34 minutes in past years, this year he went out red-hot, splitting 31:07, 2:11 marathon pace, before hitting the hills. Over the next 20 km he was slightly slower than in the last two years, but even so with a 1:38:21 split at 30 km projecting to a 2:43:55 finish he was just off pace to hit the world record of 2:43:38. 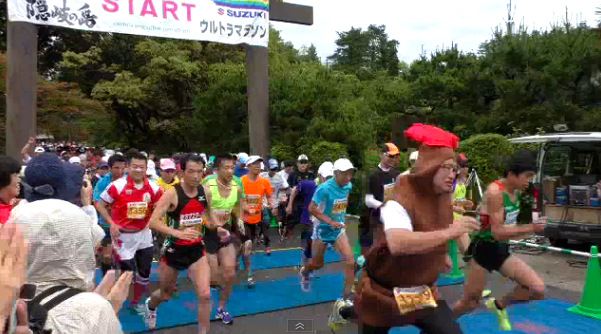 "Mid-race it got sunny and the wind came up, so it got much tougher," Kawauchi said. The hills and weather kept the world record just out of reach, but Kawauchi's 2:44:07, 2:18:30 marathon pace, still marked a massive improvement on his 2:47:27 national record two years ago in Okinoshima. Only two people have ever run faster, South Africa's Thompson Magawana with a 2:43:38 split in the 56 km Two Oceans ultra and American Josh Cox with a 2:43:45 at the Rock 'n' Roll Arizona Marathon where Cox ran to a local track after finishing the marathon and ran laps until he had covered 50 km, a mark recognized by USATF as a national record but not considered by others to have been run in a bona fide competition. "To be honest, it would be very hard to get the world record on this course," Kawauchi said. "I think I'd like to go for it at Lake Saroma." 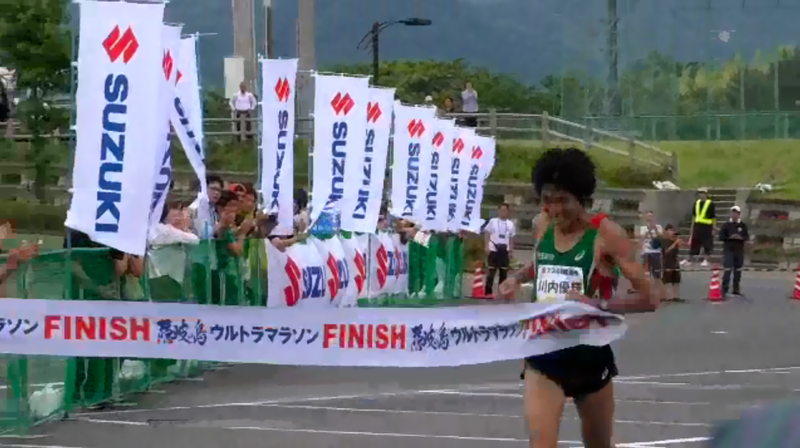 At last year's Okinoshima Kawauchi's younger brother Yoshiki Kawauchi made his 100 km debut, suffering home mightily in 11:21:52. A year older and wiser, Yoshiki returned this year to win the 100 km division in 7:20:31. It's not every day that you get to run a four-hour PB. Given the toughness of the 100 km course's hills it's a time that puts him close to national team level if he ever decides to run the fast Lake Saroma course where both the current men's and women's 100 km world records were set.